(Front row, from left) Ryan Hughes, Genero Ocanas and John Grant. (Back row, from left) Chris Blum, Brent Ulch, Dan Ziem (Dan is a former Murphy firefighter. He came back from his current department in Idaho to climb with Murphy FD. ), Adam Kroviak, Austin Owens and Thomas Johnson. Murphy CERT (Community Emergency Response Team) had seven members volunteer at the event as well. CERT Coordinator Ron Hill and CERT members Tom and Mary Hartman worked at the outside events, including the very moving opening ceremony. 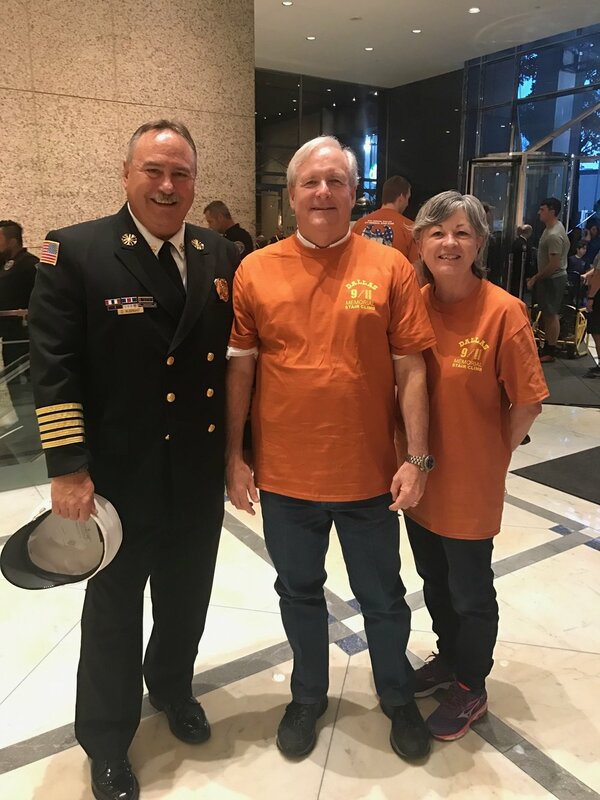 CERT Deputy Coordinator Ken Pietrasik assisted in hosting VIP’s on the 54th floor, the halfway point and the finish of the climb, including the closing ceremonies. CERT member Amy Neher worked at a water station to refresh the climbers as they climbed the Renaissance Tower. CERT members Maria and Don Reilly worked at the Brotherhood Bash, the post-climb celebration. Madeline Greenblatt, Murphy CERT members Ron Hill, Mary Hartman and Tom Hartman. Murphy Fire Chief Del Albright, council member and CERT member Don Reilly and CERT member Maria Reilly.